Everyone knows that I am a bit obsessed with millet. I really think that it is an under-used little grain! It is packed with vitamins and nutrients. It is also an alkalising food, meaning it really nourishes our body and can be digested really easily. Millet makes a great substitute for cous cous and rice, but I wanted to see what other recipes it will work well in. This week, a friend returned from Greece. She brought me back some dolma, which are vine leaves stuffed with rice and herbs. When I visited Greece I literally lived off these beauties. So, so good. You can pick them up in specialty shops or order them online. Do it, they are amazing. Anyway, I digress! 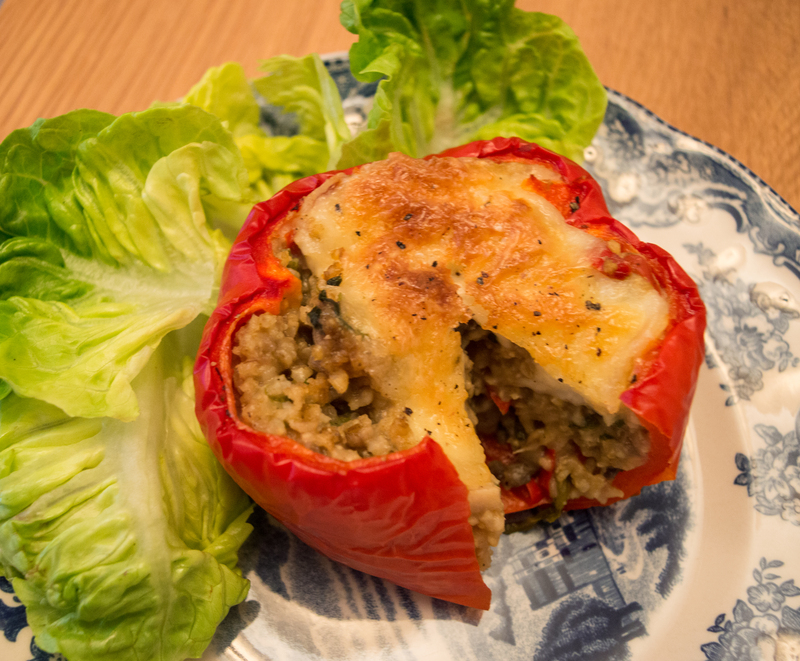 The dolma inspired me to make stuffed peppers. I thought I would make a sort of millet risotto and fill the peppers with this, and boy were they tasty! This recipe makes enough for four people. It makes a great lunch or dinner! I served this with roasted Mediterranean vegetables and salad. It was really good. I think the millet makes a great stuffing, it has a slightly nutty flavour that well suits this dish. This is brought on by toasting the grain slightly, before simmering in stock. My secret ingredient in this recipe is dried porcini. This may be my favourite mushroom – like ever. It has this rich, deep flavour that just transforms things like risotto or soups. I always have a pot of dried porcini in my cupboard. Recently at work we started selling dried porcini powder, which is insanely good. But for this recipe, I would recommend whole porcini mushrooms. 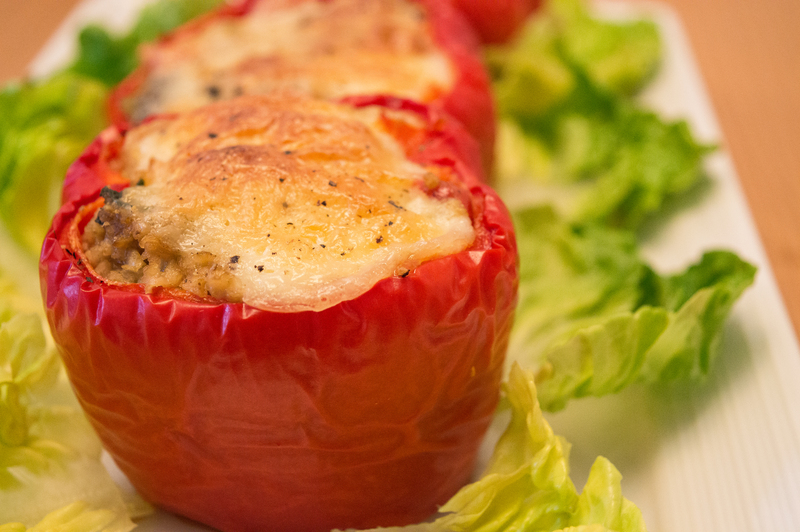 I would also recommend using red peppers, as they develop a sweet flavour when roasted. This is perfectly complimented by the savoury, rich flavour from the millet. Preheat the oven to gas mark 5. Grease four of the cupcake tin moulds, ensuring that they are wide enough apart to allow the peppers to sit in them whilst cooking. Slice the top from the peppers and scoop out the seeds. If the peppers are not flat-bottomed, slice a sliver from the bottom to ensure they sit upright in the tin. If you remove so much of the bottom of the pepper that you create a hole, then place the removed sliver inside the bottom of the pepper – effectively plugging the hole. Place the peppers aside. In a saucepan, lightly toast the millet grain over a medium flame. Ensure you do not burn it. When the grains are light brown, pour in one cup of water. Be warned, this will cause the mixture to bubble up furiously. Stir the contents of the pan ensuring that the grains do not stick and burn. Add the stock cube and chopped porcini mushrooms and simmer on a low heat. Once the grain has absorbed the water, add the rest of the water, along with the garlic powder and the white mushrooms (finely chopped). Simmer this for around 10 – 15 minutes on a low heat. If the water evaporates before the grains become fluffy, add a further 1/4 cup. Once the grains are fluffy and maybe double the size they where when dry, remove from the heat. Chop the spring onions and stir into the millet mixture. Spoon the mixture into the peppers and top with mozzarella. Sprinkle with cracked black pepper. 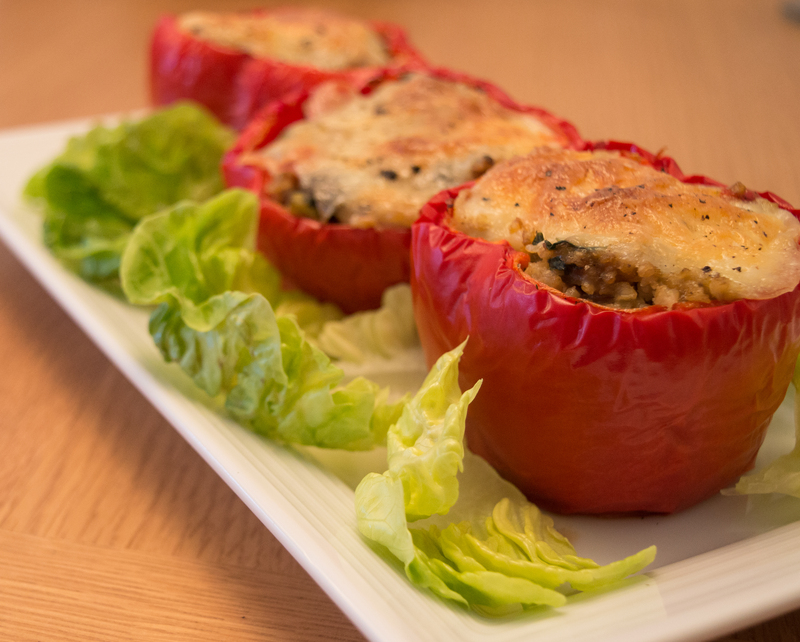 Bake for around 30 – 40 minutes, or until the peppers are soft and the cheese golden and bubbling. Serve immediately or eat chilled the next day! And that is it! Super delicious and very filling! Millet is very cheap, I get mine from Healthy Supplies – who sell this for around £2.25 per kg. Enjoy the recipe and Happy Saturday everyone! Posted on July 25, 2015 January 7, 2016 by TinaManahaiPosted in RecipeTagged 2015, bbq, dinner, Healthy, lunch, Millet, Peppers, picnic, recipe, roasted, starter, Vegetarian.